Developed especially for use by street artists, these jumbo-sized, 2¾" long × ¾" diameter pastels are ideal for long-lasting sidewalk paintings, murals, and other outdoor art. Their large size makes them easy to use, they blend beautifully, and they resist crumbling when applied to rough surfaces. 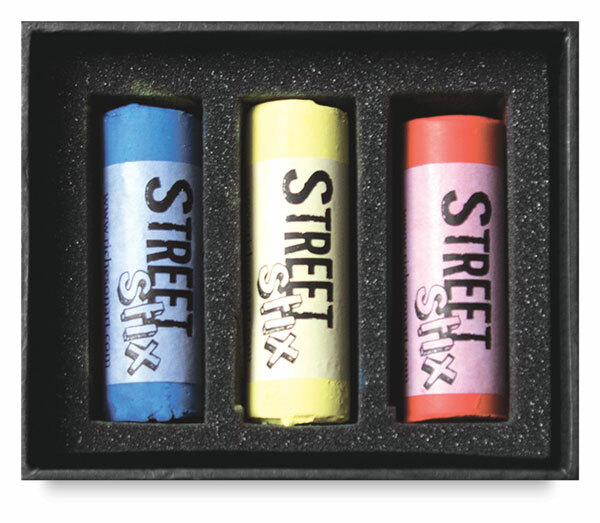 Street Stix, Sample Set of 3 — This set includes one each of Yellow 72, Blue 58, and Red 131. 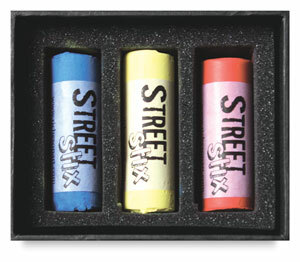 Street Stix, Set of 6 — This set includes one each of Yellow 72, Blue 58, Red 131, Grey 171, Grey 167, and Earth 151. Street Stix, Set of 12 — This set includes one each of Yellow 72, Blue 58, Red 131, Grey 171, Grey 167, Earth 151, Yellow 108, Yellow 80, Green 82, Green 2, Blue 50, and Red 62.